The attack on the World Trade Center can be seen as a symbol of what we could call the hijacking of the multitude. An extreme diversity of national, ethnic, and religious communities in New York City – a truly global public sphere in the most concrete sense – is reduced to a purely symbolic image. We could call this practice of the Bush administration, in the words of Susan Buck-Morss, “visual fundamentalism.” Striking is the speed with which every image taken of the New York City disaster was reduced within a week to one image, the American flag, and under it one caption: “The nation under attack.” President Bush is defending a kind of multitude, in fact an oligopticum (a hybridity), which is based on control, violence and surveillance, produced by a culture of the multitude in which the information society plays a dominant role. Today we no longer live in a society of discipline in which the state or other institutions of gender, class and spatial arrangements dominate our behavior from above. Instead, our reflective capacities as individuals are constantly addressed. We have to choose between different options all the time in order to be in control of our own biographies, without being aware that only very specific choices are offered. In many cases the options are not so much a matter of what is being offered to us, but what is not shown to us at all. We are confronted with the illusion of free choice and the idea of interactivity, while we are in fact controlled through our choices, located in the multitude which media and design produce. When we jump into the multitude we must investigate – and this is more urgent then ever after 9/11 – if within the current multitude a more ideological position, as opposed to the one of Americanization, or sameness disguised as difference, could be implemented. We have to implement alternative ideas. Within the stoppages of the network we should create allowances beyond the multitude dominated by the market. The theory of retroactive manifesto is not enough for making architecture politically and for overcoming the hijacking of the multitude by the challenges which the market generates. 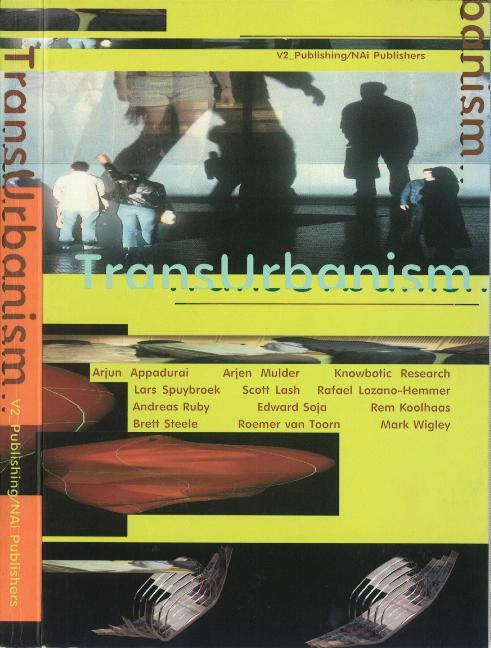 V2, Transurbanism, Nai Publishers, 2002.